Inclusions: Entrance tickets to Vaux le Vicomte, private tour guide, private transportation and taxes. 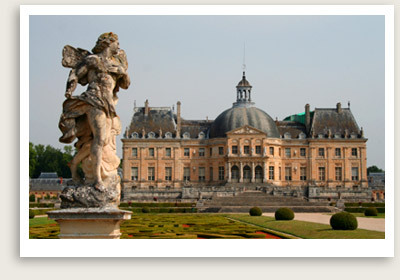 Note: Inquire about the full-day Vaux le Vicomte private tour from Paris – a night visit of the castle after dark. In this private tour of Vaux le Vicomte, you’ll enjoy the magical chateau grounds with its garden lit up by hundreds of candles, the mood completed with champagne and classical music. You may dine during the tour at a fabulous place in the countryside. Seasonal. Enjoy a fabulous day tour from Paris on a private Château de Vaux le Vicomte tour with one of our excellent English-speaking tour guides. France’s most intimate and yet spectacular château, Vaux le Vicomte is said to have inspired such a jealous rage in King Louis XIV that he imprisoned its owner, Nicolas Fouquet. You’ll take a guided tour of castle’s gardens, among Andre Lenôtre’s best work – with such splendid sights as the Carpet Parterres, the Round Pool, the Great Water Mirror, the Confessional Grotto, the Skillet Canal, the Cascades and the Spray Basin. Afterward your private guide will take you for a tailored visit inside the château, including the Vestibule, Grand Salon, Private and Royal Apartments, Herculese Salon, Chamber of the Muses, Chambre Carrée and the sumptuous kitchens. Before returning to Paris, you’ll enjoy a short stop at the Carriage Museum, located in the large stables, where you will admire magnificent old horse-drawn vehicles, brought to life with harnessed horses, coachmen and passengers. Note: This private Vaux Le Vicomte tour affords you time to sit in the gardens and sip champagne while you enjoy the view at twilight. The chateau at night is gorgeous when the gardens are lit up with hundreds of candles. Classical music and champagne completes this night experience. However, the night tour is a seasonal event: Friday nights and Saturday nights during June, July and August; Saturday nights in September and October. Schedules to be verified at time of booking.